If you were to cram the ’50s, ’60s, and ’70s into a blender, you’d end up with something close to this self-styled “diners club.” Golden Eagle, which opened in late October in a 1930s-era train depot formerly home to H. Harper Station, could have been part of Ang Lee’s The Ice Storm film set and offers a menu of throwback cocktail party dishes to match. And while it shouldn’t be taken too seriously as a restaurant, it’s also more than a nostalgia-themed hot spot appealing to millennials’ love of vintage. Owner and Atlanta native Michael Lennox practiced law for what he calls “a split second” before opening Ladybird Grove & Mess Hall along the BeltLine’s Eastside Trail in 2014. Last spring, Lennox hired Taria Camerino, a gifted pastry chef with a range of experience both here and abroad, as culinary director of Ladybird, Golden Eagle, and its adjoining trendy daytime cafe, Muchacho, which Lennox also owns. (Camerino has since taken a leave of absence for health reasons, but she set things in motion.) Jason Simpson, who previously worked at Ford Fry’s St. Cecilia (and is O.J.’s oldest son) runs the kitchens at both Golden Eagle and Muchacho. Young but classy management is in evidence everywhere. Golden Eagle’s menu is as much about time travel as its decor, starting with small plates. 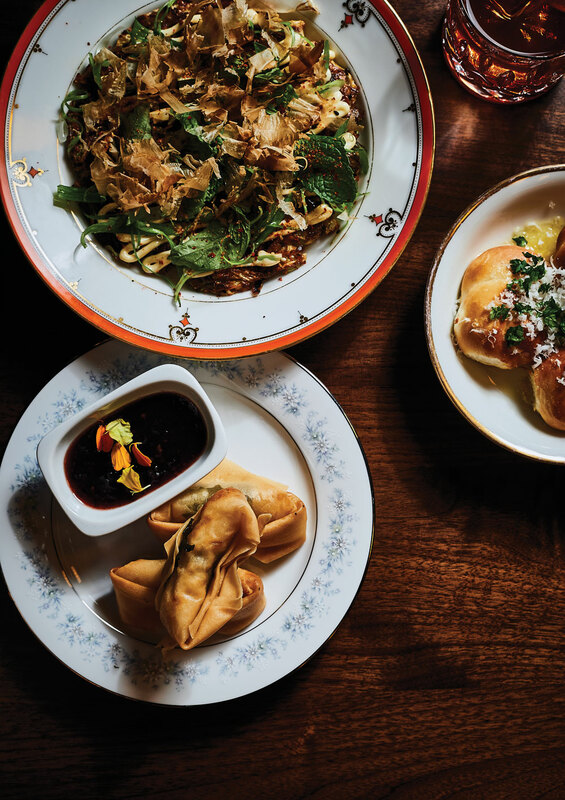 The kitchen modernizes crab rangoon—crab and cream cheese–filled appetizers popularized by Trader Vic’s tiki bars in the ’50s—by folding one whole shiso leaf into each fried dumpling. Pungent garlic knots, a feature in old-fashioned New York red sauce Italian joints, arrive swimming in a bowl of salted butter, turning them into knife-and-fork food. In a move meant to rejoin the menu with the 21st century, the team scores with a thick but supple okonomiyaki. The savory cabbage pancake topped with thin shavings of dried bonito fish, a cousin of tuna, is a common street food in Japan and has become popular in the States in recent years. Speaking of trends, the too-rich collusion of bone marrow and steak tartare has no right to be one. At Golden Eagle, as well as almost everywhere else it’s served, the combination of the two elements does a disservice to both. As for Golden Eagle’s few larger plates, the brick chicken served with brown rice and lady pea Hoppin’ John stands out, and a side of creamy potatoes au gratin makes the case for a straightforward approach over twists on classic dishes. Overall, the food here is a welcome surprise, a rare example of a menu that pulls from all over and, mostly, makes it work. 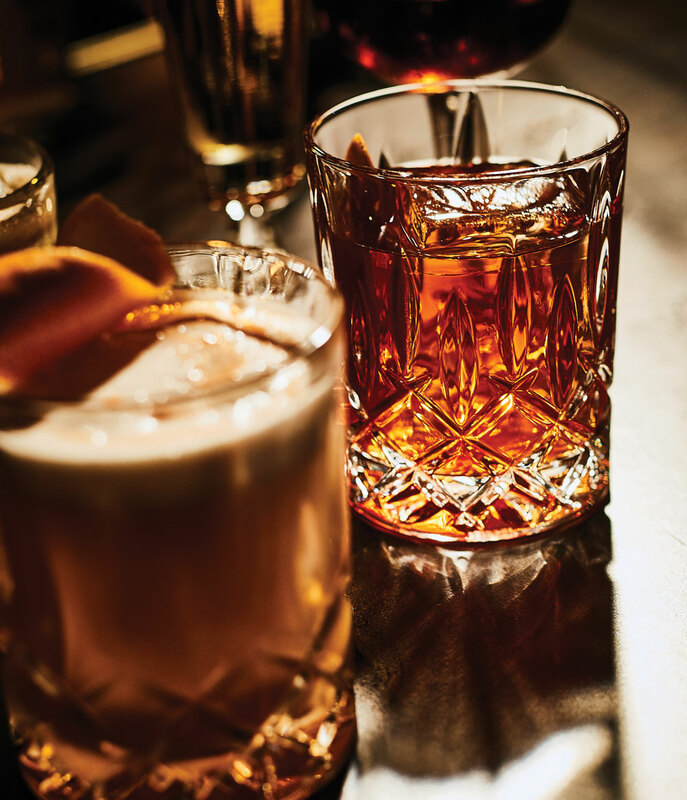 If anyone can recapture the long-forgotten pleasure of a sweet, nutty Amaretto Sour, last popular in the ’70s, it is bar manager Jeff Stockton. Of all the talents involved in Golden Eagle, Stockton, who made his name at Empire State South after spending time in New York, runs with the vintage concept and gets the most out of it. Classic drinks such as the Stinger (cognac, creme de menthe, and bitters) and the Adonis (medium-dry sherry, sweet vermouth, and orange bitters) mix with his own creations such as the almost medicinal Flannel Blazer (bourbon, Suze, lemon, rosemary, and a mist of cinnamon). Those who pine for the cocktails at H. Harper Station, which were as good as anywhere in the city, will find solace in Stockton’s creativity. It feels as if designer Elizabeth Ingram, who is responsible for the look of Ford Fry’s Marcel, wants to protect customers from the all-too-real world outside—hence the combination of blinds and heavy, dusty-blue drapes. Lennox, 32, says he envisions the place as an American Legion hall, an homage to the middle-class America of his grandparents’ era: plaid carpeting, a stuffed moose head above the bar, a map of a defunct Greyhound bus line tacked on the wall, and a restored vintage reel-to-reel sound system playing custom-made eight-hour tapes. 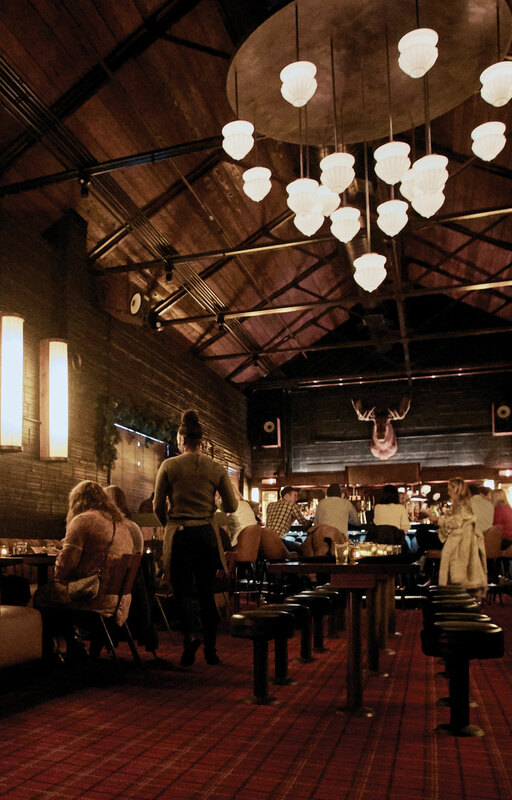 The midcentury barstools and moody lighting are glamorous details that turn Golden Eagle into what it really is: a chill spot for evenings spent with sophisticated yet informal peers. Throwback dishes and drinks dovetail with the environment at Golden Eagle, celebrating the past with just enough humor to avoid being pigeonholed as slavish to a theme.